The Academic Encounters Second edition series uses a sustained content approach to teach skills necessary for taking academic courses in English. There are two books for each content area. 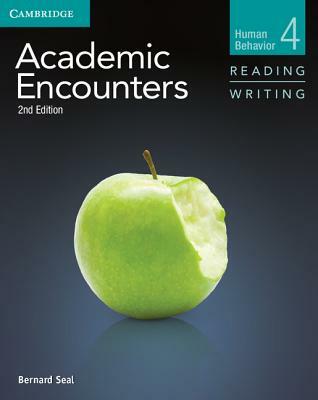 Academic Encounters Level 4 Reading and Writing Human Behavior engages students with authentic academic readings from college textbooks, photos, and charts on stimulating topics from the fields of psychology and communications. Topics include health, intelligence, and interpersonal relationships. Students develop important skills such as skimming, reading for the main idea, reading for speed, understanding vocabulary in context, summarizing, and note-taking. By completing writing assignments, students build academic writing skills and incorporate what they have learned. The topics correspond with those in Academic Encounters Level 4 Listening and Speaking Human Behavior. The books may be used independently or together.